Make 4 payments of $19.16 over 8 weeks and get it now! Advocate for Cats Kills Fleas & Worms 100% of them! Advocate clears up infections quickly by killing up to 100% of adult, immature and larval stages of hookworm and roundworms while reducing environmental contamination. In Australia, there is the potential for lungworm infection, particularly for cats with outdoor access. Advocate controls and prevents lungworm in cats. Advocate for Cats is a multi-action topical spot-on flea and internal parasite treatment. 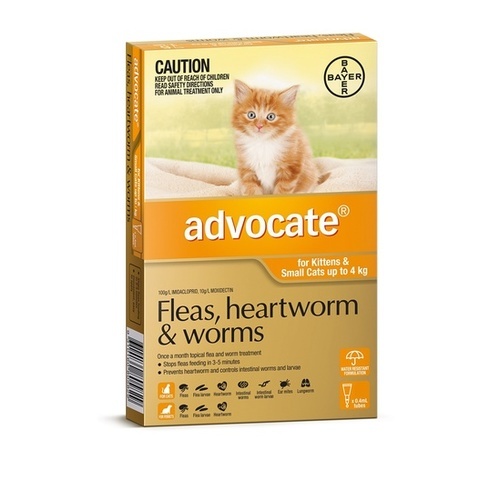 Advocate Flea Control was developed to treat flea infestation, ear mites, prevent heartworm and control infections of gastrointestinal nematodes like hookworm and roundworm. Simply apply the dose to the back of your cat's neck and from there it spreads across the skin and through the coat, where it is effective for 1 month. Advocate treated cats can do what they like to do without you worrying about their flea protection. Advocate remains effective following soap-free shampoo treatment, bathing or exposure to rain. 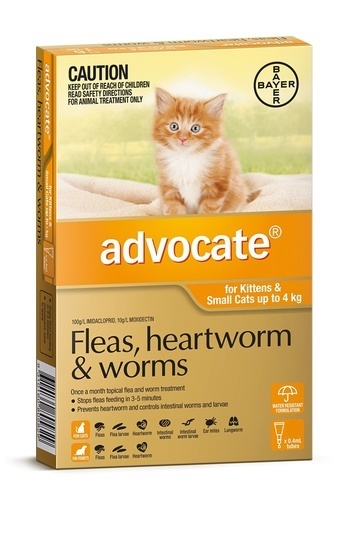 Advocate is tough on parasites but gentle enough to use on kittens from 9 weeks. Help your Cat Rest Easy, Stay Happy and Protected - Buy Now before Flea Season!